I want the cost in indian currency of new HP Deskjet 650c cartridges? Sorry, Cartridge Save only supplies HP Deskjet 640c ink cartridges within the UK so our prices are only available in GBP. I use more colour than black ink so can I order two colour cartridges instead of the black and colour pack? We do not have a pack which contains 2 x HP 49 colour ink cartridges for the Deskjet 640C printer. However, you can order 2 x single HP 49 colour cartridges by adjusting the quantity you buy before adding them to your basket. The HP 640-C has a good reputation for producing high quality, crisp prints. Some day in the not too distant future your HP 640C will run low on printer ink, and when it finally does happen you'll see that ordering HP 640C ink is generally pricey. Fortunately you have no need to be concerned about shelling out the steep costs you'll uncover on the high street because here at Cartridge Save you can get all the HP 640 C cartridges you'll want at low cost. Save a lot of cash on your ink by buying online with Cartridge Save! Don't pay high prices for a 640-C original cartridge or 640C compatible ink on the high street when it is much more straight forward to save money shopping online with Cartridge Save. You get complete satisfaction when ordering DeskJet 640C ink cartridges from us because they are underwritten by a quibble-free money back guarantee. Remember that every single purchase also has free delivery, generally delivered to you on the following day! For student or personal use, the HP Deskjet 640C is an inexpensive printer that delivers good quality prints from coloured graphics to black and white text documents. Maximum print resolution is 600 x 300 dpi. The HP Deskjet 640C printer gives good value for money and is compatible with both Macintosh and Windows computers. The HP Deskjet 640C may seem outdated though and has been surpassed by newer models in terms of print speed and quality. The Deskjet 640C inkjet printer by Hewlett Packard is quite bulky for a basic colour printing device. The parallel and USB ports are located at the back of the HP Deskjet 640C colour printer. The input tray can handle as much as 100 sheets at a time while the output sheet can handle 50 sheets. Print speeds can go as fast as 6 ppm for black and white and 3 ppm for coloured or mixed text and colour graphics. The HP Deskjet 640c has a monthly duty cycle of 1000 pages. The inexpensive HP 640C colour inkjet printer is ideal for students and even small or home offices with low volume printing needs. 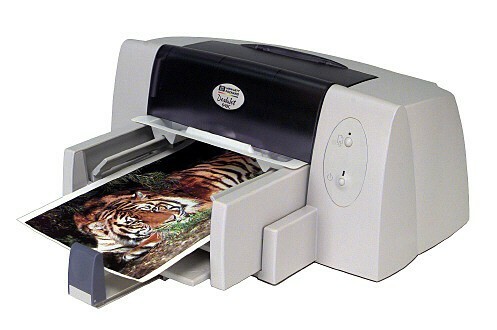 Users can expect good quality output from this reliable Deskjet printer. The HP Deskjet 640C supports both Windows and Macintosh operating systems and has a USB and parallel port. In general, the Deskjet 640C printer is cheap and easy to run. Although the HP Deskjet 640C inkjet printer is reliable, it isn't 'fast' by today's standards. The HP 640C is very basic and does not have features such as memory card readers or a PictBridge port.